At left, “Wildman” Steve Brill (image courtesy Steve Brill); at right, the spoils collected by a participant in one of Brill’s Central Park foraging tours (image credit: Fred Benenson). 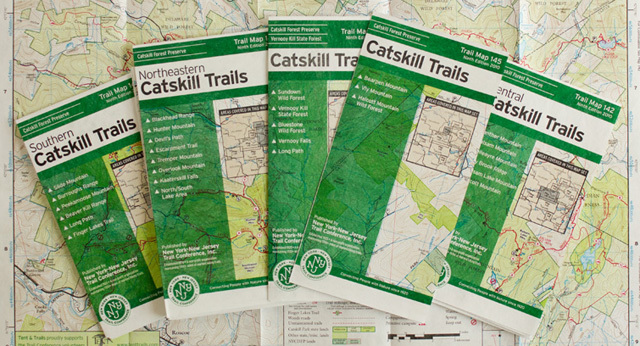 On a recent tour with him on the Appalachian Trail in Pawling New York, I was surprised when two members of our group reported being accosted by an irate hiker who was not happy to see them digging up burdock plants. The familiar admonishment issued by many parks services, “take only pictures, leave only footprints,” needs to be revised. Many harvestable plants are actually invasive species. Picking endangers few. 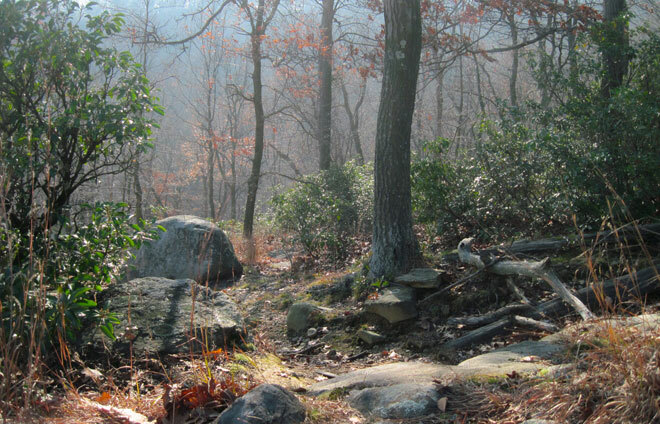 The flora of the Appalachian Trail in New York. Image credit: Renee McGurk. 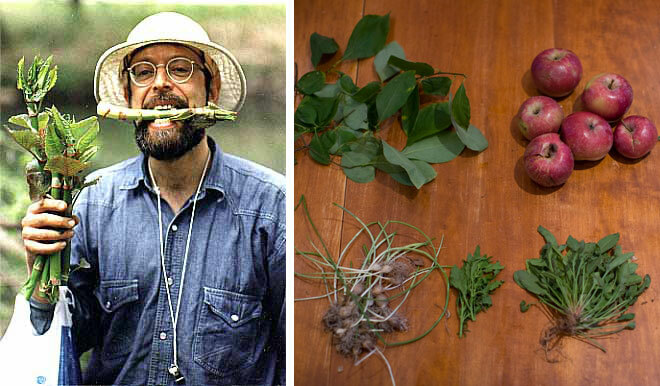 Many of the local foragers I interviewed and have met online (or in the woods) cite Wildman Steve Brill as the person who introduced them to collecting edible wild plants. Among them is Ava Chin. As a child, Chin remembers pulling up field garlic from her apartment courtyard in Queens. On her first walk with Brill in Central Park years later, she says, “Learning that so many of the ubiquitous weeds from my childhood were edible was a revelation.” Chin, who was going through personal difficulties at the time, found that foraging provided an antidote to her fears and sense of failure. “It provided insight into nature’s timing and cycles, and helped me to see the world as a place of beauty and abundance.” Now, in addition to being an English professor at the College of Staten Island CUNY, she writes about the wild edibles that grow in Brooklyn’s Fort Greene/Clinton Hill area as the Urban Forager for the local section of The New York Times. Field garlic was the first plant she profiled. You can find her recipes and learn about her foraging adventures in NYC and environs at foragergirl.com. Field garlic. Image credits: Anna Kika and The Biodiversity Library. Foraging is a matter of economic necessity in many parts of the world. Even in Europe people tend to know where and when to look for local wild foods like asparagus, but in the United States people are just starting to catch up. Wild foods have always been billed as healthy, but not until recently has it become known just how much more nutritious than cultivated foods they can be. Jo Robinson’s new book, Eating on the Wild Side, recently excerpted in The New York Times, has created quite a buzz. The book isn’t about foraging for wild foods per se, but it is a guide to finding and using foods in the produce aisle that most resemble their wild counterparts. Robinson explains how we have unknowingly bred many of the nutritious qualities out of the vegetables and fruits we eat. Based on ten years of research and analysis, she compares and contrasts the nutritional profiles of wild plants and their cultivated cousins, like dandelion greens, which have seven times more phytonutrients than the “superfood” spinach. One could extrapolate that adding even small amounts of highly nutritious wild foods to your diet can have quite a substantial benefit. This new information may make the latest wave of interest last longer than in the past. Steve Brill also credits the effect of information technology. Facebook groups like “Foraging for Everyone,” “Forager’s Unite!” and “Edible Wild Plants” provide forums where people can trade recipes and help each other identify plants. “People can communicate with each other, whether they’re preppers, vegans, freegans, environmentalists, science geeks, or parents with nature-hungry kids.” Ava Chin would also add to the mix foodies excited by recent culinary trends. 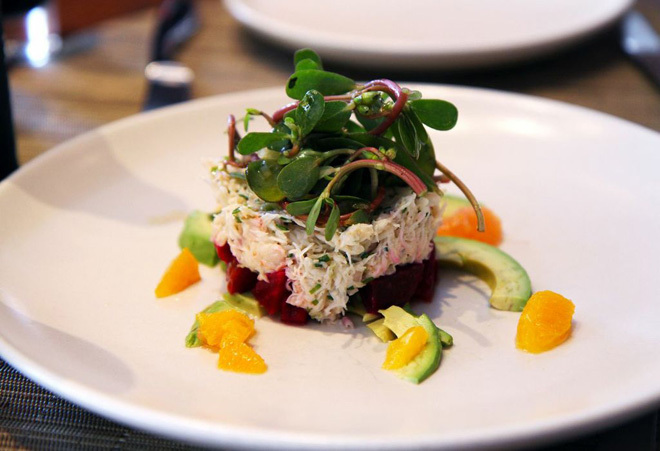 Beet and crab salad with purselane from New York City’s Print Restaurant. 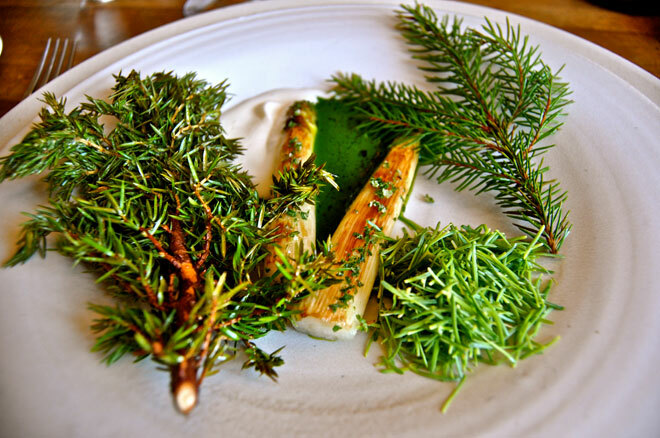 A White and Green Asparagus Pine dish served at Copenhagen’s famed restaurant Noma. Image credit: Sarah Ackerman. If you’re interested in foraging, the free version of Wildman Steve Brill’s app, Wild Edibles, which covers the twenty most common backyard species, is a good place to start. You can pick up a guidebook, do research online, or join social network groups to find out more. But the best way to learn safely is to take a tour or class with a forager who has expertise in the plants of your area. Be patient, don’t try to learn everything at once, and never taste-test, as even a small bite of the wrong leaf can have you foraging at the emergency room, which isn’t nearly as fun as your local park or woodland. 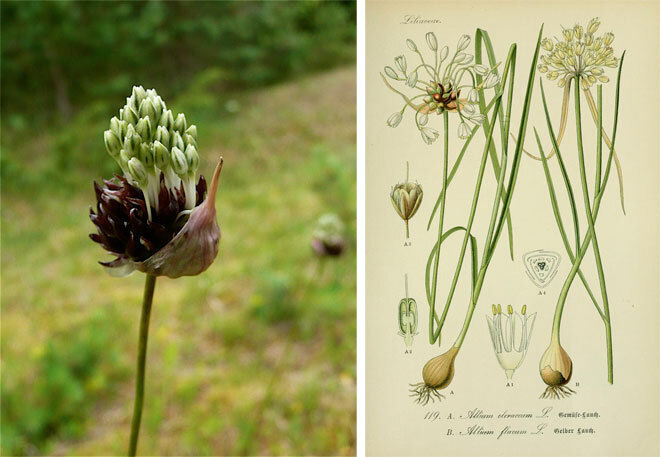 Read Part I of our foraging series—Digging Deep: Foraging through History.